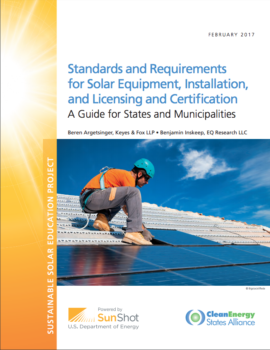 This guide co-authored by EQ Research provides policymakers with an overview of relevant codes, standards, and requirements affecting solar PV equipment, installation, and installer licensing and certification. Co-authored with Keyes & Fox LLP on behalf of the Clean Energy States Alliance (CESA), the guide “Standards and Requirements for Solar Equipment, Installation, and Licensing and Certification: A Guide for States and Municipalities,” provides a timely reference for state and local policymakers on important considerations when developing and revising building, electrical, and fire codes; zoning ordinances; equipment standards and warranty requirements; and licensing and certification requirements. Each section of the guide provides an overview of the topic, key considerations, specific state or local government examples, and recommendations for policymakers. Recommendations include creating a transparent and collaborative process when adopting standards or requirements; ensuring standards, codes, and zoning ordinances provide clarity, consistency, and certainty to the extent possible; learning from state examples and model codes; and offering training and education for parties responsible for implementation and enforcement. Click on the link to the left to access the report.